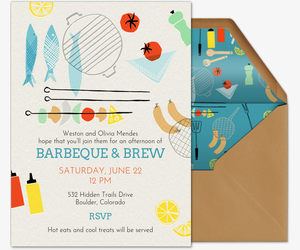 Invite friends and family over for a cookout this summer, starting with free or Premium digital invitations from Evite. 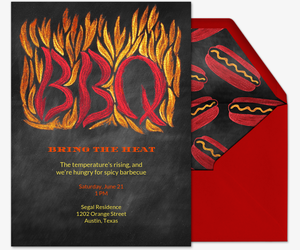 Whether you’re setting up in your backyard or by the beach, our barbecue invitation gallery has a design to match your event. 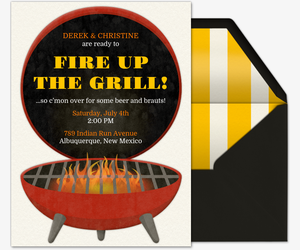 Choose from dozens of easy-to-use online invitations featuring all the BBQ basics, from the grills to the meats. Once you’ve picked your design, fill in the event information and provide all the additional details in your custom host message. 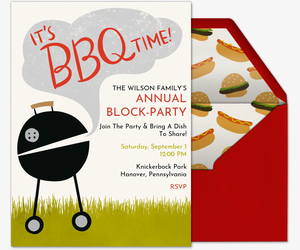 Paperless invitations keep your cookout neat and tidy. You can track the RSVPs, manage your guest list, and send messages to or share photos with guests before, during, and after the event. Plus, ask guests to supply refreshments, condiments, or marinades -- and keep tabs of the contributions using our “What to Bring” feature. Don’t leave anyone out -- track down all your friends by sending your invitation’s custom, shareable link via text or posting it across your social media network. Planning a blowout grill and chill or celebrating a BBQ birthday? Opt for one of our Premium digital designs for a clean and easy way to manage your event. Evite’s Premium, ad-free invitations look like traditional paper invitations and come with their own digital colored envelopes with deluxe liners and customizable stamps. Pricing is based on the size of your guest list. 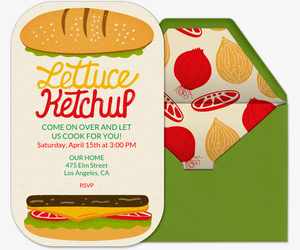 You can also add some personal style to your invitation by featuring a favorite photo on one of our upload-your-own invitation templates, or upload your own design on one of our fully customizable design-your-own invitation templates. BBQ it up with the best planning tips from the experts at Evite Party Ideas. Visit ideas.evite.com for an in-depth BBQ party guide, a Memorial Day BBQ party guide, BBQ picnic party guides, luau party guide, a block party guide and more. Get crowned king of the grill with our top BBQ recipes, like sweet and smoky BBQ sauce, and top BBQ techniques, like how to use marinades and rubs. 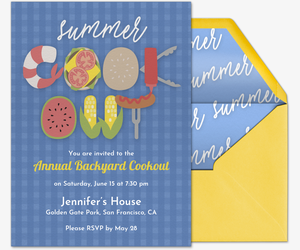 Then keep the parties going all summer long with invitations from our other summer party galleries, such as pool parties, beach parties, graduation, summer birthdays, family gatherings, and more. We also offer designs for any other occasion you can imagine. Check out our birthday party invitations, beach party invitations, pool party invitations, and holiday party invitations.